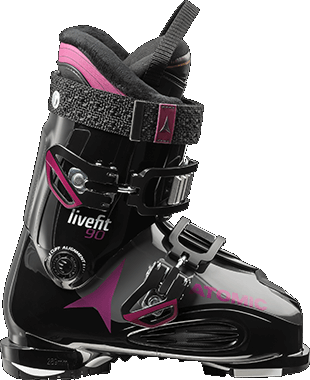 The Atomic Live Fit 90 W is our top all-mountain ski boot for sporty women skiers needing a wider fit. What makes it special is that from the moment you put it on it will instantly and automatically fit to your foot, then continuously adapt as time goes on to keep your feet comfortably and your blood flowing freely. It’s thanks to our unique Live Fit zones that instantly adjust to the width of your foot. The two oversize buckles then make the boot lighter and easier to put on and take off, while performance and foot-hold remain awesome. Plus it’s WTR compatible when used with WTR Grip Pads.